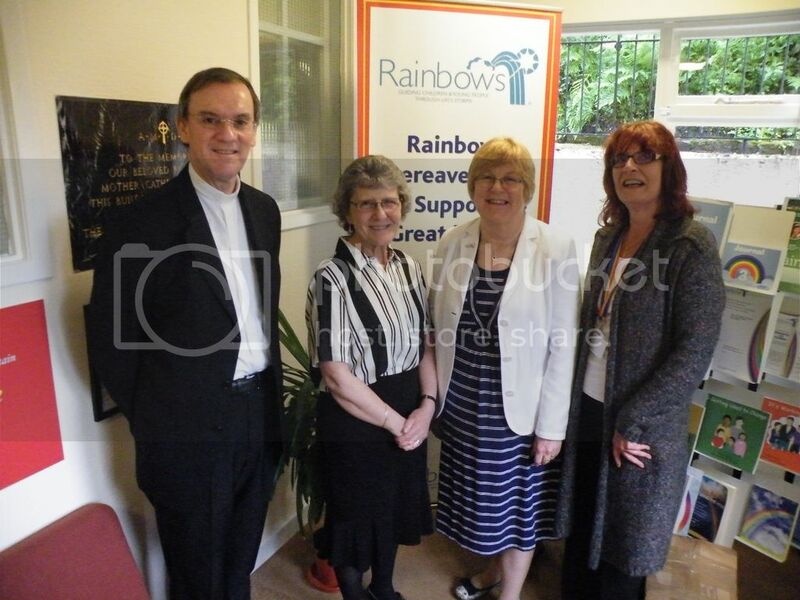 Bishop John Arnold, Bishop of Salford Diocese was warmly welcomed on his recent visit to the National Resource Centre of Rainbows Bereavement Support GB in Oldham. Having celebrated Mass in the adjoining Convent of Mercy at Werneth Grange, he was taken on a tour of the convent before visiting ‘the neighbours’ at Rainbows! Bishop John was delighted to see the National Centre of Rainbows which sends a whole range of resources to over 1260 schools across the country. Sue McDermott, Non-Executive Director of Rainbows shared with Bishop John the essential need to support children and young people grieving a significant and often devastating loss in their lives. Bishop John was also pleased to hear from Amy Howard, Centre Manager, how many new schools were starting to use the Rainbows programmes. Gerry Bradbury, former senior education officer for the Diocese of Salford and now a part-time Rainbows Development Worker for Rainbows North West was pleased to tell Bishop John that an increasing number of schools are being trained in bereavement and loss within his diocese. Before leaving, Bishop John expressed his support for the work of Rainbows and offered to help promote this most important ministry in any way he could. Bishop John Arnold, Amy Howard, Resource Centre Manager; Sue McDermott, Non-Executive Director; Gerry Bradbury, Rainbows North West Development Worker.